"Tapping," more formally known as Energy Psychology (EP), is a set of simple techniques that can free you from undesirable reactions and behaviors, and support you in being your best in any situation. Energy Psychology is just one of the proven, leading-edge tools found in the Authentic Confidence program, used by smart, powerful women seeking to embody their full potential, comfortably and easily. 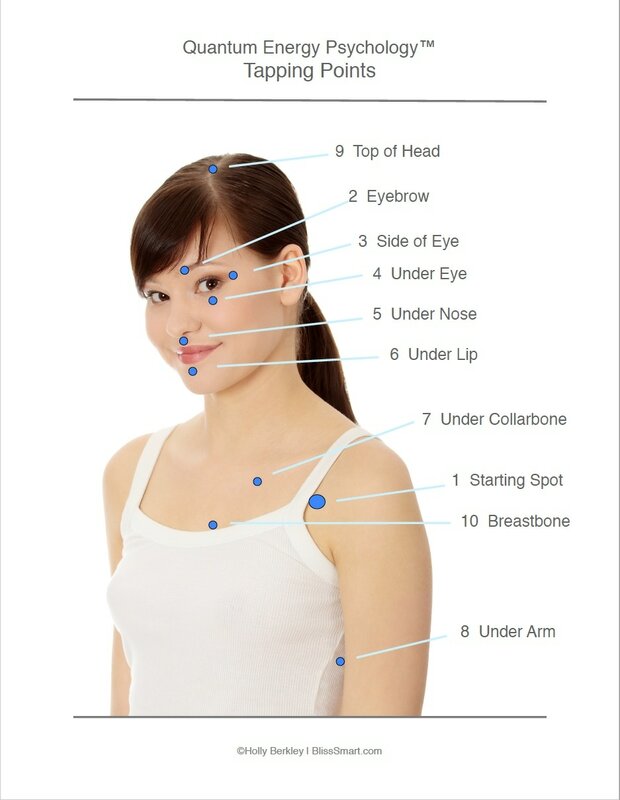 One of the most common variants is called EFT. Watch this two-minute video to see how Tapping can change your life. the effects of emotional or physical abuse. Tapping is easy to use at any age. It's safe, quick, and non-invasive, with no negative side-effects. It can be used as self-help tool, or with an experienced practitioner. Like any tool, the more experience you have with it, the more rapid, powerful and precise the outcome. As a beginner, you’ll see more positive results by sticking to generally simpler events and topics. If you’ve got a deep or complex issue, it can take a some sleuthing to unearth all the components contributing to it. Working with a highly-experienced and skilled Energy Psychology practitioner who can bring a laser focus to the source of the problem can greatly accelerate a positive outcome. EP is a psychotherapeutic approach that goes beyond the cognitive (i.e. simply thinking or talking about a problem) to access and calm the parts of the brain that store the memory of negative events and emotions. These events and emotions are the foundation of the limiting beliefs that are the biggest impediment to your success. EP works with the concept that mental issues and health conditions are related to disturbances in the body’s electrical energies and energy fields, the same ones measured in traditional medical test like EKGs. In order to calm this imbalance and reframe negative thought and emotional patterns, the disruption is first gently recreated and then released. Sometimes referred to as "acupuncture without needles,” EP combines stimulation of a series of acupressure points with a Neuro-Linguistic Programming (NLP) component of specially-worded statements. This powerful combination results in rapid positive shifts in thinking patterns, beliefs and emotional issues. The body's energy system is accessed by tapping on a number of acupuncture points with the tips of the fingers on the face and body in a particular order while focusing on the emotional elements of an issue. Tapping and focusing on a simple issue or working through aspects of a more complex issue releases the disrupted patterns of energy so that that the body and mind can experience positive change. “As a practicing psychiatrist with over 25 years of clinical experience, I see Energy Psychology as the most promising new treatment I’ve ever encountered. " Download the process instructions and use the illustration below to locate the points and their order of use. What Does Energy Have to Do With Energy Psychology? And a good source of research and case study information on EP can be found here.